Lucerne is located on Lake Lucerne and is one of the most popular Holiday destinations for tourists who visit central Switzerland. The wooden bridge called Chapel Bridge is one of the city’s main unique features. A spectacular backdrop to the city is Mt Pilatus and Rigi which is in the Swiss Alps. It is such a beautiful city that in 2010 it was voted as the 5th most popular holiday destination in the world. The unique architecture of the city can be seen through historic houses decorated with frescoes and picturesque town squares. The city is dotted with churches dating from the 17th century. The twin towers of the Hofkirche form an integral part of the townscape. As well as the cultural side of Lucerne, there is a modern innovative city with futuristic cultural buildings such as the Convention Centre, designed by leading French architect Jean Nouvel. It is one of the highlights of the city. 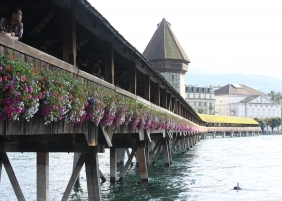 As a starting point to the Swiss Alps Lucerne has some of the most beautiful mountain scenery in Switzerland. A trip up one of Lucerne’s regional mountains is a must. The Pilatus or the Rigi are the queen of mountains. Also a must is a cruise on Lake Lucerne. 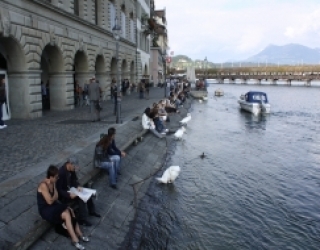 This is a great way to see the Swiss people going about their everyday lives. There is amazing little villages along the way that the cruise boat stops at. 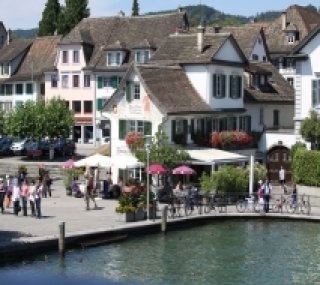 You can get off the boat and spend some time in any of these little villages. The crusie boats themselves are very well equipped to have a nice lunch or a glass of wine. On a nice day it’s the perfect way to see more of Lucerne. If you have a eurail pass you can go on any cruise for free!!! I found that Mt. Titlis was one of the most breathtaking places to visit in Switzerland if you want to see the snowfields and some beautiful scenery. From the time I left Lucerne train station to the time I reach my destination which is was little town at the top of the mountains, the scenery was breathtaking. Little villages, lakes and snow capped mountains adding to the building excitement. The Swiss Alps is voted as one of the best holiday destinations in the world. Check out the other holiday destinations that have been voted the best holiday destinations.